Bella Petite Magazine on petite celebrity daily style watch. Who’s got the look? Celebrities Lucy Liu and Kate Bosworth look fashionably petite! Tell us who your petite fashion style is most like. You can dress like the stars, we found great deals for you here on Bella Petite! This week petite celebrity 5’1″ Lucy Liu walked the red carpet at the Lucille Lortel Awards. She wore a pencil skirt that she accessorized with a mosaic Honor clutch and Etro’s black blouse and statement necklace. Petite fashionista 5’3″ Kate Bosworth wore a gold Theyskens’ Theory minidress paired with and patent platforms to stylist Harry Josh’s annual Hair Ball. 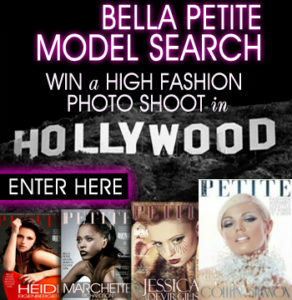 ****BELLA PETITE MAGAZINE**** Enter the Bella Petite Magazine Model Search WIN a trip to Hawaii and a high fashion spread to appear in Bella Petite Magazine! Petite models get discovered today!